Throughout this review, 2009 on left, 2011/12 on right. Click on ALL images in this review to see 1080p screenshots. There are countless reiterations of A Christmas Carol, but I never took the time to familiarize myself with 1951's Alastair Sim starring Scrooge (later renamed A Christmas Carol for its American release). Friends and acquaintances alike have told me time and time again that this was the definitive version of Charles Dickens' classic tale on film, and although I respect their opinions dearly, I was concerned their ringing endorsement would have set up my expectations high enough for a letdown. That being said, I've seen most of the other classic holiday films a bajillion times, so this year I found myself looking for something fresh to throw in my holiday film rotation. My tree was up, the lights were on, the snow was predicted to fall, and then fate ironically presented me with the opportunity to review this highly praised film on Blu-ray. My expectations were still pretty high thanks to my 'nose in the air' film snob friends (I'd consider myself to be more of a Joe six-pack, if you will), but now that I've finally seen the supposed 'definitive' version of this Christmas ghost story, I can say with certainty this film absolutely deserves its labeling as a classic. Ebenezer Scrooge is as heartless as they come, but he wasn't always this way. Once upon a time, he used to feel for his fellow man. He used to smile, laugh, and dance... he even used to love. Life has a tendency to test even the best of us from time to time however, and Ebenezer was no exception. But instead of rising above those negative experiences so he could better himself, the lesson he found from within his pain was 'look out for number one', and his new bleak outlook on life ultimately caused his heart to chill to its very core. Ebenezer devoted his life to acquiring wealth and power ever since, and despite knowing the hardships that come along with being one of the 'little guys' (being stricken with poverty, hunger, etc), Ebenezer showed no interest in helping his fellow man. Be it the less unfortunate or even his own employees, his warmth and compassion had completely vanished. How about some heat for his associates during business hours? Bah. How about letting them have a paid holiday so they can spend some time with their families? Humbug. He couldn't have even cared less about the death of his business partner and close friend. No, Scrooge lives for nothing but cold hard cash now, an obsession that has unquestionably tarnished his soul. Three spirits visit Scrooge on a fateful Christmas Eve to show him his past, present, and future, to warn him that the path he's chosen in life may very well doom his soul to an eternity of torment. However, if Scrooge can learn to open his heart to the world once again and stop solely worrying about material things, he could very well earn his redemption. 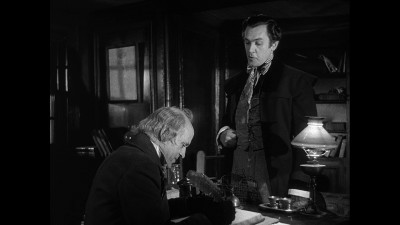 For me, the greatest achievement of A Christmas Carol, is that for a story that so blatantly takes the moral high ground on greed, corruption, and just simply being kind to your fellow man in general, it doesn't come off as being overly preachy. I instantly disconnect with any film that makes me feel like there's an enormous imaginary finger being maliciously pointed at me, but that never happens with Dickens' classic tale. Sure, the message is there so all of us can benefit from it, but the audience doesn't have to internalize that message as guilt, because they're simply observing the message as it's being conveyed to Scrooge by the spirits of Christmas past, present, and future. Of course, making sure the overall theme of the film stays within the confines of the story largely depends on the actor that's playing Scrooge. I've seen the role attempted more times than I can count on fingers and toes combined, but I'd only have to use the digits on a single hand to tell you how many times I've actually seen it done well. Much to my surprise, Alastair Sim is the best Scrooge I've ever had the pleasure of seeing. Most other actors who have played the bah-humbugger merely appeared to be grumpy old men, but Sim? I could feel the ice emanating from his skin, and I was chilled even further by the emptiness in his soulless eyes. 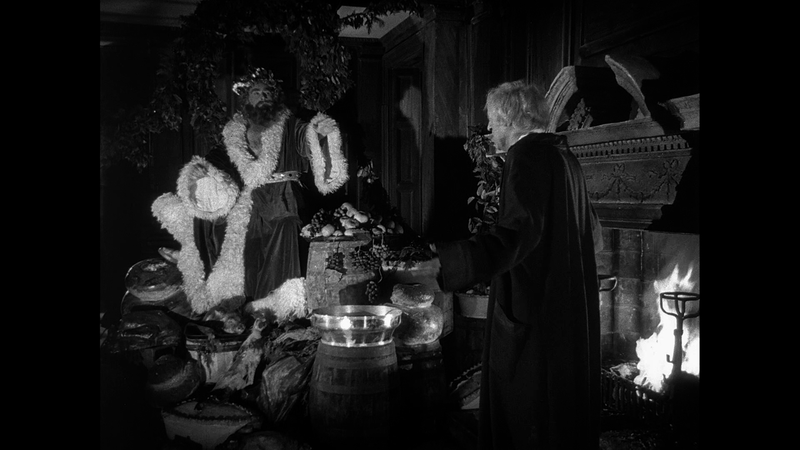 For the first time in a very long time, I didn't feel as if I was watching a mediocre stage version of A Christmas Carol shot on film. I bought Sim's portrayal as Scrooge like no other, and this justified the rest of the story in its entirety in far more engrossing ways than I've ever bared witness to. My sole complaint is that I think the director could have done a better job. Don't get me wrong, this version of A Christmas Carol is definitely the best I've seen personally, but there were a few moments in the film that were dangerously close to taking me out of the moment. For example, I didn't buy Michael Hordern's performance as Jacob Marley, not one bit. Marley is the first apparition to appear to Ebenezer, and he's supposed to show through his own pain and suffering what Scrooge will one day become. Unfortunately, Hordern was borderline comical at times, and this drastically reduced the severity that the situation was supposed to convey. 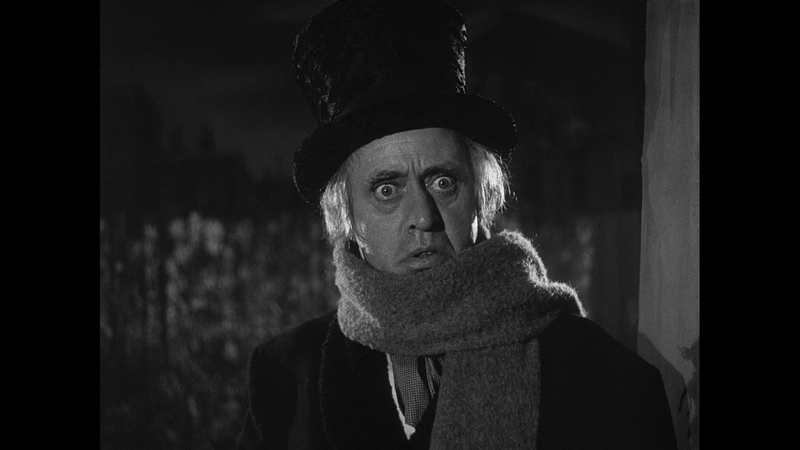 Also, as great as Alastair Sim is as Ebenezer Scrooge, there are a few moments in the film where he over emotes, and I feel this could have been easily corrected if there was some better direction. Is it the definitive version of A Christmas Carol? It's certainly the best I've seen, but it's hard to classify something as 'definitive' when there are so many reiterations of this classic Dickens' tale out there, at least certainly many more than I'll ever have the chance to see. If you prefer your holiday classics to have something most modern holiday films lack - heart - then this is a film you simply shouldn't miss. In my review of the 2009 release by VCI, I stated that A Christmas Carol, despite some missing frames and a semi-dirty print, looked wonderful considering its age. At the time however, I hadn't really seen too many black and white films on the format, and that's changed considerably in the few years since. Over the course of time, I've come to the realization that the original Blu-ray from 2009 was over sharpened, and suffered from crushed blacks and hot contrast. Compared to the number of black and white films or TV shows on the format today, it looks downright ugly, despite faring much better than the DVD that preceded it. Still, it's VCI's quality control from 2009 that puzzles me to this day - A shoddy transfer can be explained for many reasons (although still unacceptable), but a blatantly obvious issue of missing frames? VCI apparently made a new scan with fresh technology at their disposal, yet there were still complaints of missing frames and even an audio dropout or two. Still, it proved to be a significantly superior release overall. Honestly, the difference is night and day. What was once artificially sharpened and harsh, now appears to be pleasantly well defined. This not only helps to enhance the natural clarity from the source, but also resolves film grain in a way that no longer looks noisy. Black levels and contrast have also been improved considerably. There's so much detail revealed in the background now, it's as if a dark curtain behind Scrooge had been lifted. This also now reveals an appreciable amount of depth, and furthermore, the bah humbugger himself no longer appears as white as the ghosts he's so dreadfully frightened of. 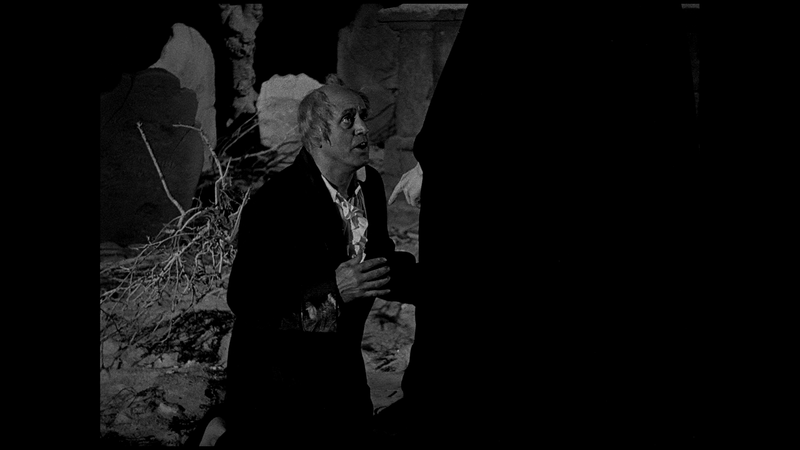 So, there's no doubt that despite some remaining print damage, this 1080p, VC-1 encoded transfer of A Christmas Carol (1.33:1) is the definitive version for the moment, although there are still some minor issues with the presentation. Their release from 2011 fixed the missing frames a great deal, but they still pop out now and again. It's not as jarring an experience anymore, but the issue is there, nonetheless. VCI claimed to fix even this minor issue for their 2012 release, but I find no evidence to support that claim. In fact, when I pop this disc into my Blu-ray drive and select the movie file, it's labeled as 'Christmas Carol 2011'. So, those hoping for the now minor issue of missing frames to be resolved, just know the video presentation on this disc compared to that of 2011, offers nothing new. Still, for those who don't yet own a copy of the 2011 or 2012 release, now is the time to bite, as it's truly the best this film is likely to ever look. Well, let's get right to it - Are there audio dropouts on this release? The answer here I believe lies with the encode and it how 'responds' to certain equipment chains, because I didn't experience the issue in 2011, and I'm not experiencing any now. The only time there's a noticeable clip in the audio, is when some skipped frames enter the mix. Also, for those who are wondering if we were given something other than the LPCM tracks from the previous release, the answer is 'no', as we're still treated to the Mono and 5.1 LPCM mixes. VCI has claimed to 'fix' everything for this 2012 release, but all they've really done was remove 'Dolby' from the menus and rear cover it, which are now accurately reflecting 'PCM'. Still, these mixes are adequate enough - The dialogue, music and effects all have a bit more clarity than they did before, and the 'cramped' feeling on the previous releases has been alleviated to some degree, as both tracks now sound slightly fuller. The Mono track is obviously the best option, since it represents the original sound design, but the 5.1 repurposing actually surprised me with how listenable it was. There's still some of that weird phasing and reverb, but it's nowhere near as bad as it was on the 2009 release. Could A Christmas Carol sound much better? Perhaps if it were given a proper restoration - These mixes from 2011 are more faithful to the source than ever before, yes, but the noise floor is more pronounced. It's nowhere near as bad as, oh, the likes of Dracula from the days of DVD, but the noise floor is there, regardless. Still, these audio tracks should appease fans of the film and make them feel the upgrade was worth it. -Introduction by Leonard Maltin - For 5 minutes, Mr. Maltin expresses how much of an affect this film had on his childhood, and continues further with some interesting tidbits about the film. Audio Commentary with Marcus Hearn/George Cole - This was actually a pretty entertaining track. 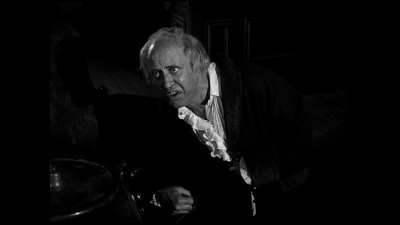 George Cole played Scrooge in his earlier years in the film, and is able to share interesting tidbits about numerous aspects of the film's production. Marcus Hearn, film historian, interjects whenever Cole starts running dry on whatever topic he's discussing at the moment, and this keeps the track lively throughout the entirety of the runtime. If you're a fan of this film, this is worth the listen. -Dead to Begin with - The Darker Side of a Classic - Nearly half an hour in length, film historian Sir Christopher Frayling discusses the important of this film in regards to post-World War II Britain. Very informative, and film buffs shouldn't miss out on this piece of historical wealth. -Scrooge by Another Name - Distributing A Christmas Carol - Richard Gordon, a US distributor, reminisces about his experience with the film. -The Human Blarney Stone - Life and Films of Brian Desmond Hurst - Allan Esler Smith, the great-great nephew of Hurst, provides a great wealth of information on this great talent throughout the course of this 41 minute documentary. -Alastair Sim Version - Too Good to be Shown only at Christmastime - Written by Fred Guida, this narrative covers all the ins and outs of the film, particular its impact on film in general. -Silent Dickens - Scrooge 1922 / Bleak House 1922 - Two prior silent film editions of A Christmas Carol have been included on this disc. Again, film historians should be tickled at their inclusion! -Scrooge Revisited - A brief tour of the locations that were used for filming. -Campbell Playhouse - A Christmas Carol - This is the original 1939 radio dramatization, narrated by none other than Orson Welles. -Bibliographic Essay by Fred Guida - This is a wonderful essay by Mr. Guida discussing the many bibliographic stories detailing Dickens' life and works. This version of A Christmas Carol is going to find itself spinning in my Blu-ray player every year around this time, and frankly, I'm sorry I waited so long to see it. With new versions of the classic Dickens' tale spewing out of Hollywood too often to keep track of, it's nice to know there's at least one version out there that gets it right. There are many more versions of this story than I'll ever get around to seeing, so it's hard for me to say for sure if this is the definitive version of the film, despite my friends trying to drill that 'fact' into my head for years. I can say with certainty however, that this is the best version of the classic Christmas ghost story that I've personally seen. If you don't already own this film on Blu-ray, or perhaps only own the release from 2009, then this is really a no-brainer - This release of A Christmas Carol is well worth it. There's still the minor issue of missing frames, but the lossless audio and drastically improved video presentation are worth the money alone. The supplemental material is also in-depth and noteworthy for avid film historians. Highly Recommended.